NO SLOW START THIS TIME – The first laugher of the year. The Pistons, plagued by slow starts, took a 24-point lead in the first quarter and it didn’t dip below 17 points until the last two minutes. The lead went as high as 29 in the fourth quarter. Their 40 first-quarter points made it the highest-scoring quarter of the season, as was their 74-point first half. The Pistons had seven players in double figures after three quarters and Blake Griffin wasn’t one of them. 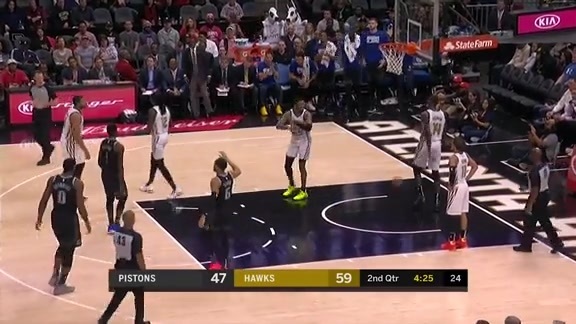 Griffin played 10 minutes of the first quarter and didn’t take a shot, but he did register six assists and five rebounds, finishing with six points, nine rebounds and nine assists. Andre Drummond finished with 23 points and 11 rebounds as the Pistons picked up a season-high 30 assists and hit a season-high 20 3-point shots in a season-high 47 attempts. BULLOCK BREAKS OUT – Reggie Bullock, who’d scored just one point and missed all 10 of his shots over the past two games, scored seven points in the first three minutes to help the Pistons get out of the blocks fast. He finished with 13 points, hitting 3 of 6 from the 3-point line after hitting just 23 percent for the season from the arc, in just 23 minutes as Dwane Casey let his bench absorb big minutes in the second half. Bullock added four assists and three rebounds. The Pistons also got 12 points in their 74-point first half from the other starting wing, Glenn Robinson III, who also played sparingly in the second half, finishing with 19 minutes. 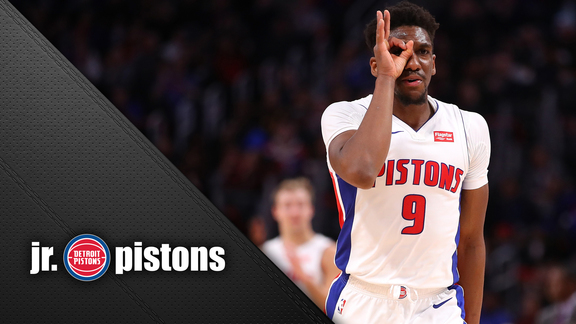 BENCH BANG – The Pistons got a second straight strong outing from a newly constituted bench unit that consists of three guards – Ish Smith, Langston Galloway and Jose Calderon – to go with Stanley Johnson and Zaza Pachulia. They combined for 29 first-half points and finished with 60. Johnson missed his first three shots, but finished with a season-high 22 points and hit 4 of 9 from the 3-point arc. He added seven rebounds. Galloway had another strong shooting game, hitting 5 of 9 from the 3-point arc, to finish with 16 points. In his last two games, Galloway is 9 of 17 from the field with all 17 shots being 3-point attempts. Smith had 10 points and three assists. Calderon finished with five points and four assists. Rookie Khyri Thomas made his NBA debut, playing the last four minutes and recording his first basket, a triple.